Introducing Citydashboard.org: A Live View of City Data – here at the Centre for Advanced Spatial Analysis, University College London, we have just made live our latest in a series of services examining live data feeds – CityDashBoard. The system pulls in data from a variety feeds, developing our view that the next trend in OpenData is towards a live view of the city and live data feeds. With the cities of Birmingham, Cardiff, Edinburgh, Glasgow, Leeds, London, Manchester and Newcastle included, it is London with the largets amount of live feeds at the moment. 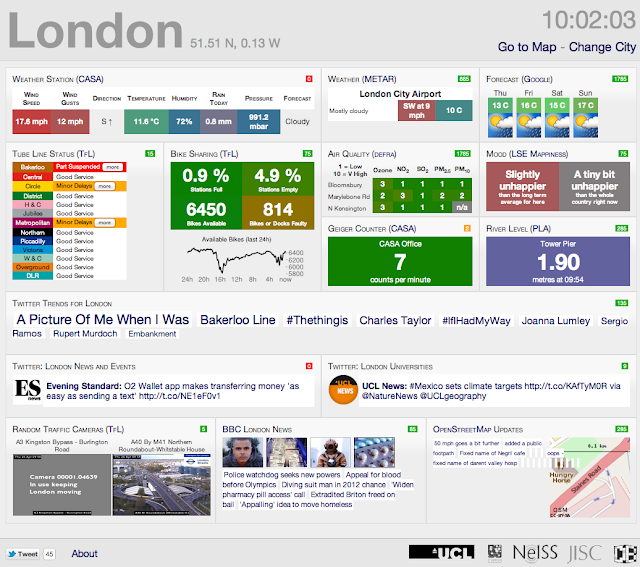 As Duncan Geere noted in the write up of CityDashboard in Wired – the dashboard for the city pulls in TfL data, RSS feeds from BBC London news, geographical information from OpenStreetMap, weather data from Google, trends from Twitter, traffic cameras and water levels along the Thames. It also includes data from UCL’s radiation detector. Based on a concept developed by Oliver O’Brien, Andrew Hudson-Smith and Richard Milton, here in CASA, the design and planning was developed by Duncan Smith and Oliver O’Brien with website development ultimately led by Oliver. Take a look at Olivers site for development details. The project is an output of NeISS, which is funded by JISC.